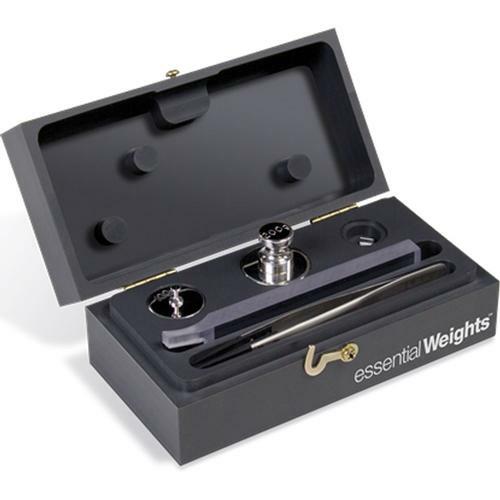 Essential Weights are customized sets of three or four stainless steel test weights specifically tailored to your laboratory precision weighing equipment. Ideal for specific calibrations, shift tests and sensitivity tests, Essential Weights are designed with convenience in mind without sacrificing accuracy or quality. These polished stainless steel Type II design ASTM Class 1 weights include a small, durable carrying case. Maintain routine laboratory calibration best practices with Rice Lake’s Essential Weights.. Essential Weights are customized sets of three or four stainless steel test weights specifically tailored to your laboratory precision weighing equipment. Ideal for specific calibrations, shift tests and sensitivity tests, Essential Weights are designed with convenience in mind without sacrificing accuracy or quality. These polished stainless steel Type II design ASTM Class 1 weights include a small, durable carrying case. Maintain routine laboratory calibration best practices with Rice Lake’s Essential Weights.